Minolta Glass – Beercan from Michael Merto on Vimeo. The “Beercan” is probably the most well known of Minolta’s first generation AF glass. It is heavy. 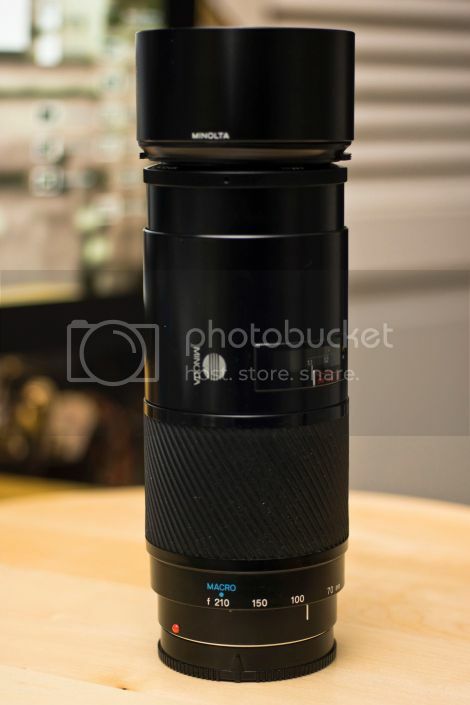 70-210mm and a constant f4 is a pretty nice feature set considering ebay prices go around $150 US dollars. The autofocus is driven by the camera’s in-body motor and the glass is propelled by a screw. The zooming is in body so the barrel doesn’t extend as you zip across the range. It’s pretty long though and looks obscene mounted on the a77 without a grip. It’s sharp from around 5.6. The focus ring is narrow and not the best for full-time manual adjusting. He used a Sony A77 (price & specs) with the Minolta. Be sure to check the pics Michael shot with the Minolta 70-210mm f/4, and use slidoo.com to look for the lens on eBay.